Robert Long does a nice rant against the Dutch gays on this LP, which he calls cowards for not coming up for their rights. But I want to stick with songs for this project. There are not much songs on this LP; it are basically speeches. De Zangeres Zonder Naam sings a song about Anita Bryant, a popular American anti-gay activist of those days, and this live version should at least be on the bonus CD of the Pink Panters Collection. 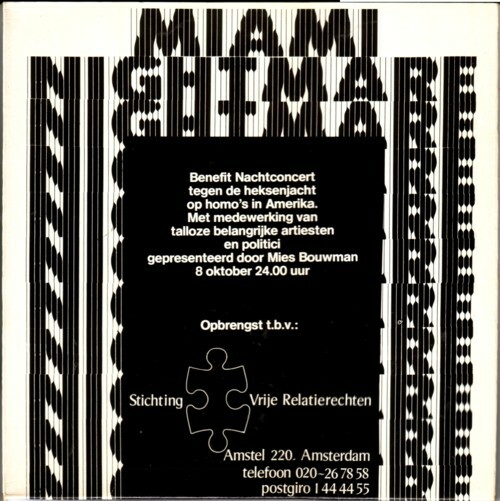 She is announced by Mies Bouwman, by the way.who hosted the “Miami nightmare” show, of which parts are on this LP.